We got a new mailbox. It took us a long time. We first started thinking about getting a new mailbox last December, but we only just put it up because we have had a hell of a time with it. I know that right about now you're all, "Dear lord, I think Stimey has officially run out of things to blog about because mailboxes are not a topic of conversation." To this I would say that you are wrong. Soooooooo wrong. OMG OMG OMG OMG I LOVE HIM SO MUCH. We were going to name him Beauregard, but too many people asked if he was named after the attorney general and that was not okay with me, so we renamed him Claude, because he looks like a dignified French bear and also because you can humorously imagine that his name is Clawed. I should back up because Claude's journey to us began three years ago when Alex and I went to Key West. 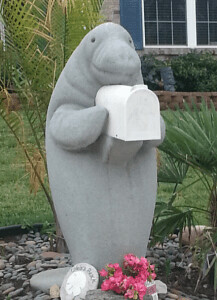 If you live in/visit Florida, you know this, but if you don't frequent the Sunshine State, you may not know that something like fifty percent of the mailboxes there are in manatee form. Seriously. Like, at least half of them. They make for very cute street-adjacent art and I think that if we lived in Florida, Alex would have okayed the installation of one of our own. As we live in Maryland, Alex was less excited about the idea of sticking a manatee statue at the end of our driveway. He also won't let me put gargoyles on the roof or lion statues on either side of our driveway. It's like he's completely against whimsy. I accepted his no, but sporadically brought it up for the ensuing two years and occasionally bad talked him to friends for being the absolute worst joykiller in the world. Cut to last summer when we vacationed in Wisconsin where there are chainsaw carvers galore with showlots on the sides of roads. 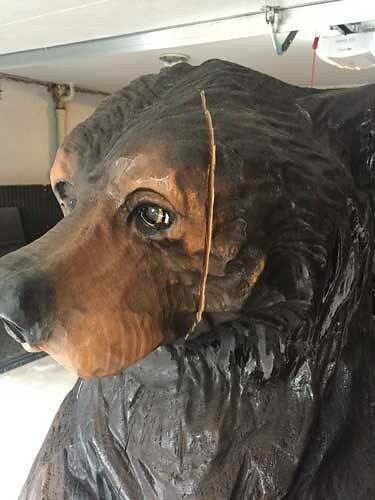 A few years ago, I had seen a small (maybe two feet tall) carved bear with a "welcome" sign at one of those lots and I thought I might be able to talk Alex into letting me put that outside our door. 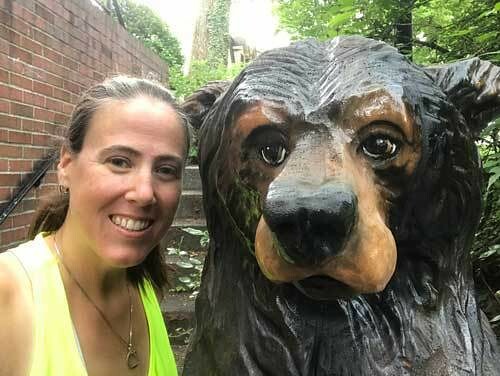 We couldn't find the welcome bear, but suddenly Alex was ALL ABOUT finding a bear mailbox, which, in retrospect, would have made the two-day drive home uncomfortable/impossible. Once we got back, we did a little half-hearted searching for someone who could carve and ship such a mailbox to us, but we realized how prohibitively expensive that would be so we kind of trailed off. 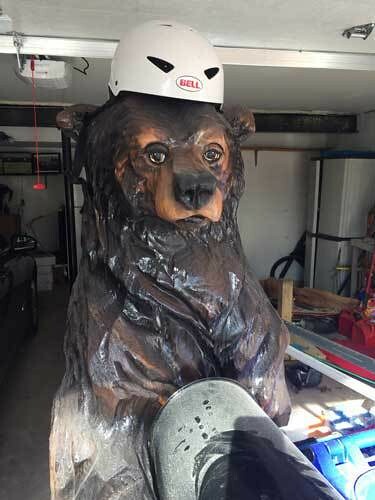 Until one day it occurred to me that chainsaw bear carvers probably live in places other than Wisconsin and I looked up Maryland carvers and voila! there was one an hour's drive away from me. It turns out this guy is awesome at carving but a little less good at organizing, so while I heartily recommend him for all of your chainsaw carving needs, I recommend that you also give him a little extra time for responding to emails, etc. Joe—awesome chainsaw carver is Joe—cheerfully accepted my commission for an entirely reasonable price and asked us to select a mailbox. It was at this point that Señor No Manatee was all, "Can we get this fish mailbox?" and I was all, "Who are you?" It seemed a little over the top. 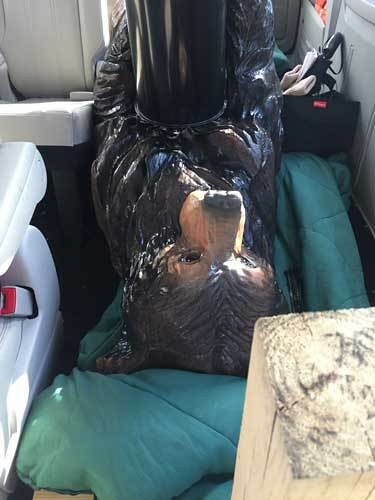 Because if you’re going with a six-foot-tall bear mailbox, you have to know when to show restraint. We purchased the normal mailbox I insisted on and had it delivered to Joe while we commenced to waiting, anxiously tapping our feet and wondering exactly how much our neighbors were going to hate us. Finally the day came for me to drive up to meet Claude. I was nervous. What if I didn't like him? What if he wasn't what I imagined? What if he didn't fit in my car? None of those things happened except that he wasn't what I had imagined—he was far cuter and more awesome that I'd imagined. The guy helped me put Claude in my van and then I drove off down the road with the most fun cargo that I'd ever cargoed. Also, Claude is really heavy, which I discovered when trying to remove him from my car. 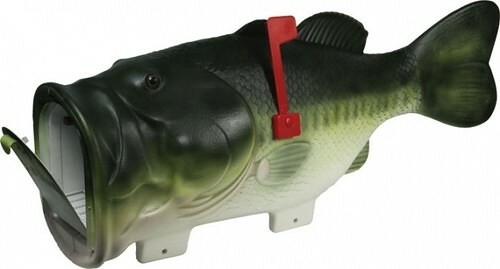 Alex and I then spent weeks thinking about how to attach Claude to our property because the last thing we want is for someone to walk off with the greatest thing we own. We debated screwing him into our asphalt driveway...We considered cementing him into a hole we'd dig in the grass at the side of the driveway...We...actually, that's all we came up with, but we're indecisive and lazy people, which is not a good combination. 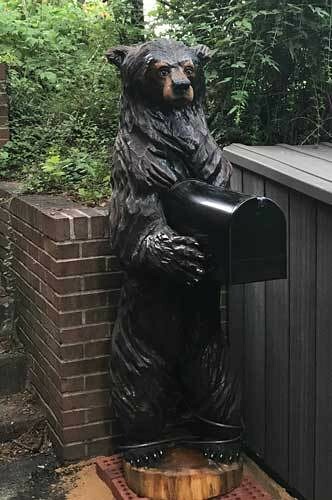 In fact, we couldn't even decide on where exactly we wanted him, because there are a surprising number of places you can put a tall bear mailbox on our property. 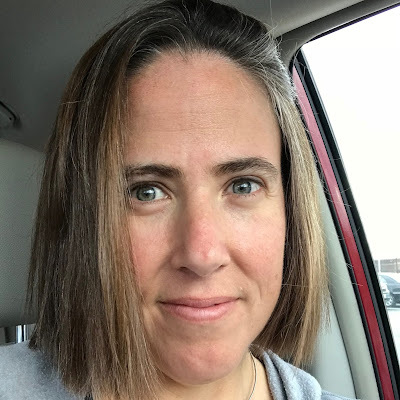 Meanwhile, he languished in our garage, where I would nod solemnly and say his name every time I passed him and the kids did degrading things to him. Just wait until Claude hears about our Halloween plans for him. But before we were able to come to a decision/overcome inertia, something terrible happened. Claude...got sick. Evidently sometimes wood settles and cracks and it's a thing that happens but OH MY POOR DEAR BABY BEAR CLAUDE!!! It was at this point that Alex and my indecisiveness paid off because we didn't have to uninstall Claude to take him back to Joe, who calmly assured us that wood is easy to fix. I trucked Claude back up to Joe and shortly thereafter he was fixed and back in my arms. Now we really had to decide where to put Claude. Most of those deliberations involved Alex and I deciding how much we wanted to be The Bear House and how obtrusive Claude would be to our neighborhood aesthetic environment. We eventually picked the spot you see in the first photo because (1) he's not too obvious from the street there, but (2) everyone who comes to our door gets to see him, and (3) we were able to see an easy Claude-securing method in that spot. We decided to chain Claude to some stuff. You can see his little leg shackles in the first photo, which is a little sad, but let's try to not focus on that, okay? Alex and I headed down to Home Depot where our chain acquisition turned into a whole thing because Alex and I are Alex and I and we turn everything into a thing. We went down the chain aisle where I was hoping to find a nice solid black chain, but weirdly enough, the chain I was seeing in my brain didn't exist. For some reason, we settled on a giant, bright silver chain that we had to have custom cut for us. Because it was so thick, it took the poor Home Depot employee quite a bit of time to cut it. Meanwhile I went to find a padlock and came upon what I felt was a better solution for the chain, giving up a little security for better aesthetics. Unfortunately, Home Depot guy was mid cut, so I waited until he was done and then showed Alex, who agreed with me. 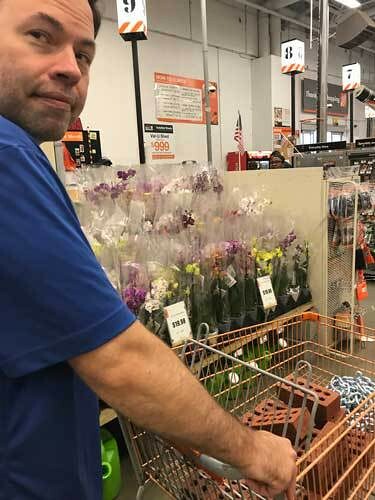 He wanted to just drop the chain in the brick section, but I thought that would make our non-purchase even more obvious and I thought we needed to put it back in the chain bucket because it was a nice long length of chain that someone else could use and maybe the Home Depot guy would never even know we didn't buy it. But the Home Depot guy continued to stand in the aisle for a really long time. Alex and I circled and circled, waiting for the guy to move on. We could not have looked more suspicious if we'd tried. We finally saw the guy had left the aisle, but by the time we'd circled back around, he was at the end of the aisle, looked at us, looked at the chain in our cart, and asked if he could help us with anything else, so we had to do more aimless circling before we were FINALLY able to dump the chain and get the hell out of there. It's possible we may have overthought the whole thing. After our Home Depot ordeal, it was a simple matter to lay down some sand (for leveling), some bricks (for drainage), and twist Claude's tether around several items/trees (to prevent escape). I lurked around for the mail carrier on the next mail day and watched from my window as he nonchalantly dropped our mail in the box with only the slightest perceptible interest in the giant bear holding it. It was extremely disappointing. See, I figure that mail carriers see a bazillion boring mailboxes every day. I feel like Claude could be a bright point in their day if only they would give him a chance. I might have to start putting hats on him. This is the best thing I have ever read. I now want a Claude for my porch. And I totally love you guys. You are SO my Tribe. Well. There is nothing I can say here that you don't already know, which is that Claude is clearly one of the best purchases of your entire life, and also I am now in the market for something similar. I would need a mailbox twice that size with all the stuff I get. Oh, goodie! I get to meet Claude. I love Claude! Best mailbox ever! I would love having a cool mailbox. Since I live in an apartment, I don't get to have my own mailbox at all... just a little compartment with a lock in front of the building. HOW could you NOT pick the fish mailbox? Bear holding his freshly caught fish = awesome! Love this! There is a cow mailbox in our neighborhood that every little kid loves. They all pull her rope tail. Sometimes the owner says, "Moooooo!" from an inconspicuous site (like the garage) causing the kids to jump. That could not look more perfect. The mailbox is actually pretty big. It's just that Claude is so big that the box looks smaller. Everyone should have a Claude.